The BillyOh Deluxe garden seat cushion is a great way to compliment an old or brand new furniture set. At 4cm thick these cushions provide excellent comfort and look stylish. The Deluxe collection is available in 4 colours black, green, natural or navy blue helping you to tailor your set. Cushions should be completely dry before storing them away. We recommend that this product is always stored indoors when not in use. Why buy The Delux BillyOh – Seat Pad? 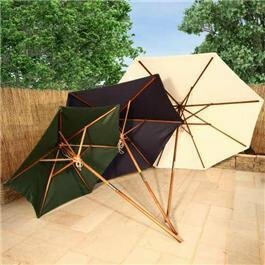 The Sturdi parasol is available in 3 different sizes: 2m, 2.5m & 3.0m and 6 different colours: Green, Natural, Navy Blue, Black, Taupe & Terracotta to match the CC Collection range of cushions. The parasols have removable covers to allow for machine washing at 40 degree’s C.
Why buy a Sturdi Parasol? Made from compound concrete, the base has a rubber surround and can be easily moved by rolling it. This two seat round bistro set offers you the perfect place to relax and catch up with a friend over a cup of coffee. The lightweight design and foldable chairs and table, mean moving the set around is easy. The stylish round table has just the right amount of space for you and a loved one. So enjoy a drink together on a warm summer’s evening or relax with your favourite book! 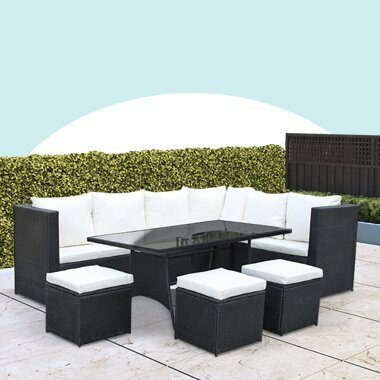 If you’ve got a small balcony or a patio area that needs some love and attention, then this set could be the answer to your garden woes. The foldable table is the ideal size for you to spread out your books and magazines, or to accommodate lunch and drinks for two. The Hampton Bistro Set will look perfect for breakfast and equally good in the evening for cocktails for two. We know that getting a furniture set to suit your garden isn’t all about size, the style is important too. The traditional look of the Hampton Bistro Set brings French bistro living to your garden, while the dark tones of the folding eucalyptus chairs and table provide the perfect match to both traditional and modern outdoor spaces. The Hampton Bistro Set can be easily stored, so getting your new garden furniture in and out of wherever you choose to store it will only take a few minutes. 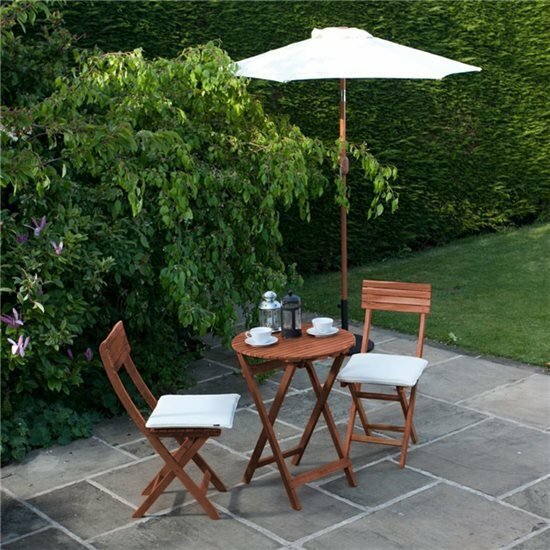 Thanks to the simple folding features on both the table and chairs, it’ll be in place in your garden straight away too. What’s great about the round table that comes with the Hampton Bistro Set from BillyOh is the practical shape. It’s perfect if you don’t have a lot of garden space so need to squeeze the table into a small area, or even up against a wall. Yet, it feels equally at home in the sunshine in the middle of the garden on those beautiful summer days. You also have the choice of adding a BillyOh Aluminium Crank and Tilt Garden Parasol in a variety of colours, which is a great way to provide shade for your Bistro Set. The parasol benefits from a classic design with the added durability of an aluminium frame and steel ribs. Operation is effortless thanks to the aluminium crank system making it a joy to use. Offering a feature for your table which is practical as well as stylish, this parasol is supplied with decorative finials that can be unscrewed allowing for the cover to be machine washed.With it’s effortless crank tilt functionality, the water proof Aluminium Parasol is the perfect accompaniment to any garden party. The BillyOh Deluxe garden seat cushion is a great way to add extra comfort to your Hampton Bistro Set. At 4cm thick, these cushions provide excellent comfort and sophistication. The cushions are available in black, green, natural or navy blue which makes finding the right colour to suit your garden style, easy. Cushions should be completely dry before storing them away. We recommend that this product is always stored indoors when not in use. All of the covers and fillings used in this product conform to British Standard BS5852 1988 (Fire) (Safety) Regulations. Available in the following colours: Green, Natural, Navy Blue & Black. This stylish set is constructed from a durable Eucalyptus wood is an ideal material for outdoor furniture. You don’t have to compromise quality with style, the eucalyptus wood is long-lasting and looks great too! So, you can be sure that the Hampton Bistro Set set will perfectly complement the design of your garden.The high back design of the chairs not only looks elegant but also provides great support for your back too! If you would like to add a sturdy base to your Bistro Set, you have the option of a 15K Black or Red sturdy base. Made from compound concrete, the base has a rubber surround and can be easily moved by rolling it.